Andalusia (/ˌændəˈluːsiəˌ -ziəˌ -ʒⁱə/; Spanish: Andalucía [andaluˈθi.a, -si.a]) is a south-western European region established as an autonomous community of the Kingdom of Spain. It is the most populated and the second largest in area of the autonomous communities in Spain. The Andalusian autonomous community is officially recognised as a nationality of Spain. The territory is divided into eight provinces: Almería, Cádiz, Córdoba, Granada, Huelva, Jaén, Málaga and Seville. Its capital is the city of Seville (Spanish: Sevilla). The name "Andalusia" is derived from the Arabic word Al-Andalus (الأندلس) and this term derives in turn from an older word: Vandalusia or land of the Vandals. As well as Muslim and Romani influences, the region's history and culture have been influenced by the earlier Iberians, Carthaginians/Phoenicians, Greeks, Romans, Vandals, Visigoths, Byzantines, as well as the later Castilian and other Christian North Iberian nationalities who conquered and repopulated the area in the latter phases of the Reconquista. Although its present form is certainly derived from the Arabic translation of Vandalusia or "Land of the Vandals"., the etymology of the name "Andalusia" is disputed, and the extent of Iberian territory encompassed by the name has changed over the centuries. The Sierra Morena separates Andalusia from the plains of Extremadura and Castile–La Mancha on Spain's Meseta Central. Although sparsely populated, this is not a particularly high range, and its highest point, the 1,323-metre (4,341 ft) peak of La Bañuela in the Sierra Madrona, lies outside of Andalusia. Within the Sierra Morena, the gorge of Despeñaperros forms a natural frontier between Castile and Andalusia. The High Court of Andalusia (Tribunal Superior de Justicia de Andalucía) in Granada is subject only to the higher jurisdiction of Supreme Court of Spain. The High Court is not an organ of the Autonomous Community, but rather of the Judiciary of Spain, which is unitary throughout the kingdom and whose powers are not transferred to the autonomous communities. The Andalusian territory is divided into 88 legal/judicial districts (partidos judiciales). In 2005, 5.35 percent of the population of Andalusia were born outside of Spain. This is a relatively low number for a Spanish region, the national average being three percentage points higher. The immigrants are not evenly distributed among the Andalusian provinces: Almería, with a 15.20 percent immigrant population, is third among all provinces in Spain, while at the other extreme Jaén is only 2.07 percent immigrants and Córdoba 1.77 percent. The predominant nationalities among the immigrant populations are Moroccan (92,500, constituting 17.79 percent of the foreigners living in Andalusia) and British (15.25 percent across the region). When comparing regions rather than individual countries, the single largest immigrant block is from Latin America, outnumbering either North Africans or non-Spanish Western Europeans. Demographically, this group has provided an important addition to the Andalusian labor force. Organic farming has recently undergone rapid expansion in Andalusia, mainly for export to European markets but with increasing demand developing in Spain. On the west (Atlantic) coast are the Costa de la Luz (provinces of Huelva and Cádiz), and on the east (Mediterranean) coast, the Costa del Sol (provinces of Cádiz y Málaga), Costa Tropical (Granada and part of Almería) and the Costa de Almería. In 2004, the Blue Flag beach program of the non-profit Foundation for Environmental Education recognized 66 Andalusian beaches and 18 pleasure craft ports as being in a good state of conservation in terms of sustainability, accessibility, and quality. Nonetheless, the level of tourism on the Andalusian coasts has been high enough to have a significant environmental impact, and other organizations—such as the Spanish Ecologists in Action (Ecologistas en Acción) with their description of "Black Flag beaches" or Greenpeace—have expressed the opposite sentiment. However, Hotel chains such as Fuerte Hotels have ensured that sustainability within the tourism industry is one of their highest priorities. Andalusia was the birthplace of such great painters as Velázquez and Murillo (Seville) and, more recently, Picasso (Málaga); Picasso is memorialized by his native city at the Museo Picasso Málaga and Natal House Foundation; the Casa de Murillo was a house museum 1982–1998, but is now mostly offices for the Andalusian Council of Culture. The CAC Málaga (Museum of Modern Art) is the most visited museum of Andalusiaand has offered exhibitions of artists such as Louise Bourgeois, Jake and Dinos Chapman, Gerhard Richter, Anish Kapoor, Ron Mueck or Rodney Graham. Malaga is also located part of the private Carmen Thyssen-Bornemisza Collection at Carmen Thyssen Museum. The lack of high-quality fossil fuels in Andalusia has led to a strong dependency on petroleum imports. Still, Andalusia has a strong potential for the development of renewable energy, above all wind energy. The Andalusian Energy Agency established in 2005 by the autonomous government, is a new governmental organ charged with the development of energy policy and provision of a sufficient supply of energy for the community. No single Andalusian newspaper is distributed throughout the region, not even with local editions. In eastern Andalusia the Diario Ideal has editions tailored for the provinces if Almería, Granada, and Jaén. Grupo Joly is based in Andalucia, backed by Andalusian capital, and publishes eight daily newspapers there. Efforts to create a newspaper for the entire autonomous region have not succeeded (the most recent as of 2009 was the Diario de Andalucía). The national press (El País, El Mundo, ABC, etc.) include sections or editions specific to Andalusia. The monumental architecture of the centuries immediately after the Reconquista often displayed an assertion of Christian hegemony through architecture that referenced non-Arab influences. Some of the greatest Renaissance buildings in Andalusia are from the then-kingdom of Jaén: the Jaén Cathedral, designed in part by Andrés de Vandelvira, served as a model for the Cathedral of Malaga and Guadix; the centers of Úbeda and Baeza, dating largely from this era, are UNESCO World Heritage Sites. Seville and its kingdom also figured prominently in this era, as is shown by the Casa consistorial de Sevilla, the Hospital de las Cinco Llagas or the Charterhouse of Jerez de la Frontera. The Palace of Charles V in Granada is uniquely important for its Italianate purism. Andalusia also has such Baroque-era buildings as the Palace of San Telmo in Seville (seat of the current autonomic presidency), the Church of Our Lady of Reposo in Campillos, and the Granada Charterhouse. Academicism gave the region the Royal Tobacco Factory in Seville and Neoclassicism the nucleus of Cádiz, such as its city hall, Royal Prison and the Oratorio de la Santa Cueva. In all, Andalusians have won 6 gold medals, 11 silver, and 2 bronze. Winners of multiple medals include the Cordoban boxer Rafael Lozano (bronze in the 1996 Summer Olympics at Atlanta, Georgia, USA and silver in the 2000 Summer Olympics in Sydney, Australia); sailor Theresa Zabell, Malagueña by adoption (gold medals at Barcelona in 1992 and Atlanta in 1996). Other notable winners have been Granadan tennis player Manuel Orantes (silver in the men's singles of the demonstration tournament in Mexico City in 1968), Jerezano riders Ignacio Rambla and Rafael Soto (silver in dressage in Athens in 2004) and the racewalker Paquillo Fernández from Guadix (silver in Athens in 2004). ↑ 23.0 23.1 El Manifiesto andalucista de Córdoba describió a Andalucía como realidad nacional en 1919, cuyo espíritu los andaluces encauzaron plenamente a través del proceso de autogobierno recogido en nuestra Carta Magna. En 1978 los andaluces dieron un amplio respaldo al consenso constitucional. Hoy, la Constitución, en su artículo 2, reconoce a Andalucía como una nacionalidad en el marco de la unidad indisoluble de la nación española. Andalusian Statute of Autonomy on Wikisource, in Spanish. ↑ Ecosistemas naturales de Andalucía. Alta montaña, Junta de Andalucía (2008). Retrieved 2 February 2009. 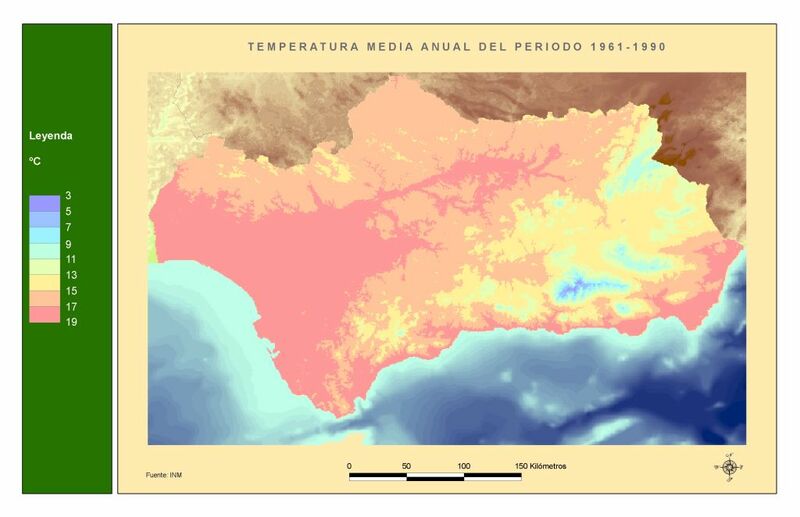 ↑ See Temperatura media anual del periodo 1961–1990, Consejería de Medio Ambiente de la Junta de Andalucía, for a climate map. Retrieved 8 December 2009. ↑ "Bases para la Ordenación del Territorio de Andalucía", 1990, p. 126, in Spanish. ↑ List of local entities in Andalusia, in Spanish. ↑ Tít. III. Art. 97. Comarcas – Estatuto de Autonomía de Andalucía 2007: :"1. La comarca se configura como la agrupación voluntaria de municipios limítrofes con características geográficas, económicas, sociales e históricas afines. 2. Por ley del Parlamento de Andalucía podrá regularse la creación de comarcas, que establecerá, también, sus competencias. Se requerirá en todo caso el acuerdo de los Ayuntamientos afectados y la aprobación del Consejo de Gobierno." ↑ Mancomunidades (map), dgal.map.es. You can click the map to see the mancomunidades of each individual province. ↑ Inversion of the population pyramid is a process by which the number of older people exceeds the number of younger people. This often occurs in developed countries as birth rates decline. ↑ Avance del Padrón a 1 de enero de 2008. Datos provisionales. Comunidades autónomas y provincias, INE. Retrieved 2008-08-05. Link does not have relevant data 10 December 2009. ↑ Instituto de Estadística de Andalucía. Official estimates. ↑ Junta de Andalucía, Impacto de la ayuda a la producción sobre el olivar andaluz, in El Olivar Andaluz, Besana. Retrieved 9 October 2008. ↑ Decreto 553/1967, de 2 de marzo, por el que se declara conjunto histórico artístico el sector denominado «Lugares Colombinos» en la provincia de Huelva. BOE nº 69 de 22 March 1967. ↑ Abengoa opens the first EU commercial concentrating Solar Power Tower, RenewableEnergyMagazine.com, 2 April 2007. ↑ La central solar de alta temperatura de Andasol 2 ya ha puesto la primera piedra, Energías Renovables, 12 July 2007. ↑ Plataforma Solar de Almeria, Institute of Technical Thermodynamics, German Aerospace Center. Retrieved 11 December 2009. ↑ Plan Andaluz de Investigación, Desarrollo e Innovación. PAIDI. 1 May 2005. ↑ Andalucía Comunidad Cultural. "Medios de comunicación en Red Andaluza". Archived from the original on 15 October 2008. Retrieved 8 October 2008. <templatestyles src="Module:Citation/CS1/styles.css"></templatestyles> That web page gives a rather complete listing of Andalusian media organizations. ↑ José Ortega y Gasset, Teoría de Andalucía, 1927, online at Wikisource in Spanish. ↑ From Article 37.1.18 of the Andalusian Statute of Autonomy: Principios rectores de las políticas públicas: 18º La conservación y puesta en valor del patrimonio cultural, histórico y artístico de Andalucía, especialmente del flamenco. ↑ From Article 68 of the Andalusian Statute of Autonomy: Corresponde asimismo a la Comunidad Autónoma (Andaluza) la competencia exclusiva en materia de conocimiento, conservación, investigación, formación, promoción y difusión del flamenco como elemento singular del patrimonio cultural andaluz. ↑ Andalucía alcanza los 1.000 rodajes gestionados por la Red de Ciudades de Cine de AFC, 2008-07-30, www.andaluciafilm.com. Retrieved 16 December 2009. ↑ El Rocio Pilgrimage, visithuelva.com. Retrieved 15 April 2010. ↑ hermandadrociosevilla.com, passim. Retrieved 14 April 2010. ↑ Eva Díaz Pérez, Los excesos del Rocío, El Mundo, 2001-05-27. Retrieved 14 April 2010. ↑ For some maps of various isoglosses, see the online Isogloss maps for Iberian Peninsula Spanish, according to ALPI. ↑ See la tierra de María Santísima in the dictionary of the Real Academia Española. ↑ 163.0 163.1 For greater specificity on the Denominaciones de Origen, see M.A.P.A., in Spanish. ↑ Real Escuela Andaluza de Arte Ecuestre, official site. ↑ 2006: Sevilla win big in Monaco, 25 August 2006, UEFA.com. Retrieved 17 December 2009. ↑ LIGAS NACIONALES / Liga "Arteal Ventanas" Superdivisión Masculina, Real Federación Española de Tenis de Mesa. Retrieved 2009-12-17 cites for the current prominent status of these teams. This page was last modified on 3 January 2016, at 09:21.